Juggernaut's offensive pack of cards is for all you horrible ad people. 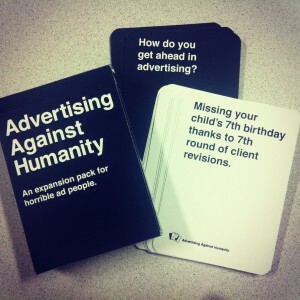 “These cards are as despicable and offensive as the advertising industry itself.” Well, at least they’re honest. More than 400 writers, art directors and creative directors were faced with this frank proclamation when they received a Cards Against Humanity expansion pack, called Advertising Against Humanity, in their post box yesterday morning. The hilarious pack (made for “horrible ad people” as it so lovingly explains) was put together for Toronto post-production shop The Juggernaut by CD Lyranda Martin Evans and AD Travis Cowdy over at KBS, and is meant to bring some barnyard humour to the hard-working people of advertising during this holiday season. But, as we’re sure you know, the real reason they went through the trouble of making this “giant ad” for Juggernaut is for “the sole purpose of winning awards.” Again with the forthrightness. We could get used to this.